Vend 40 selections of your favorite snacks with no hang ups or refunds. Includes Sensit Guaranteed delivery system. 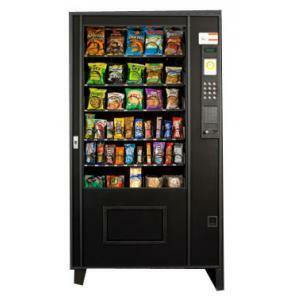 Refurbished AMS 39 Snack machine is a great choice for those who want a machine to work hard for you and never stop. Refurbished AMS 39 Snack Machine comes with 40 of your favorite selections. This machine can sell virtually any type and size merchandise. The Refurbished AMS 39 Snack Machine is used in the Car Wash industry to sell car wash products such as Armour-all , Air fresheners and towels. It is also one of the best machines at selling all varieties of snacks. We never let a vending machine go out the door until it looks and works like brand new. With the amount of years we have been in the business we know what the machine needs to work problem free. We not only sell you the machine but take care of the service after the sale. “Guaranteed Delivery System” – This machine has an infared beam that goes across the top of the delivery bin. The item that has been chosen by the customer falls thru the beam to stop the spiral from turning. If no product falls thru the beam the customer can make another selection or get their money back. “Energy Sensit” – Energy saving device built into the machine. Comes with rebuilt MEI changer and bill validator..
An optional new Changer and bill acceptor can be installed for $309.00 with a 2 year warranty. 90 day warranty on parts. Shipping not included.